Is your dog living on social security handouts? In the wild our dogs would have spent the major part of their day locating food. Nowadays our dogs are provided with their entire daily allotment of food in a bowl at the end of each day. This is the canine equivalent to social security payments – money for nothing! This food is then inhaled at warp speed and the dog is left with nothing to do. It is then up to the dog to find other, often unapproved, ways to stimulate itself. Food can assist us in providing mental stimulation for our dogs in the form of food puzzles. Providing your dog with a variety food puzzles in the form of food dispensing toys ensures their long and often lonely days are full of fun and interesting things to do and discover. While your dog is busy trying to work out how to get his daily food from a toy he’s not vocally announcing his presence to the entire neighbourhood, landscaping the backyard or re-designing your furniture! Super bouncy and irresistible. Kong is a puncture resistant rubber dog toy that helps clean teeth and massages gums. It is considered the world’s best dog toy for its legendary strength, quality and performance. 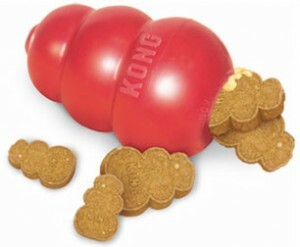 Kongs are widely used for therapy and prevention of boredom, separation anxiety and other behavioural issues. Regular use of Kongs can also improve oral health. Their unpredictable bounce lures most dogs into a game of chase, catch and chew. The hollow centre can be filled with food and treats. A dab of peanut butter spread around the inside is very effective. 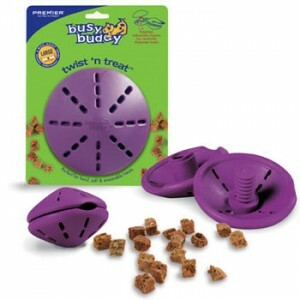 Once your dog plays successfully with the Twist ‘n Treat, you can screw the opening tighter to extend the length of play.The adjustable opening allows the Twist ‘n Treat to be filled with a variety of hard, soft, and smear-able treats. Also great for dogs on raw food diets! Made of natural rubber. 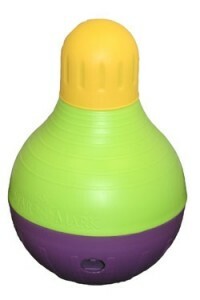 The Tug-a-Jug provides a multi-sensory appeal to keep your dog engaged and motivated to play. The unique design of this patented toy allows dogs to see, smell, & hear the treats as they roll around in the jug. The Tug-a-Jug not only dispenses treats, it can also be used for obedience training and feeding meals. 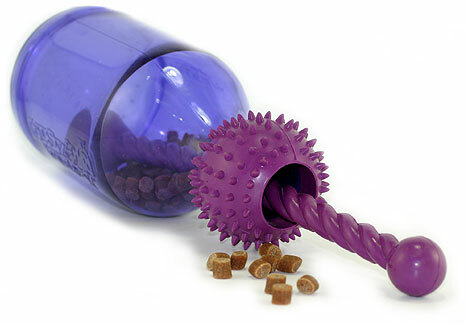 You can increase the degree of difficulty by placing various sized balls inside the jug with kibble or treats. As the balls roll back and forth, they act as a barrier and method of metering the food. By changing the size of the balls or the treats, the level of difficulty can be adjusted to suit your dog’s level of play and interest. We recommend using a couple of golf balls or small balls to begin with to build your dog’s confidence as he plays. Once he understands the new rules of the game, you can increase the number &/or diameter of the balls. 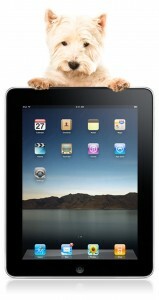 The Bob-A-Lot recently won the bronze award for best new product at the HH Backer Pet Trade Show. It can be filled with treats or food in a top or bottom chamber, and then must be manipulated by the dog’s nose or feet to extract the goodies inside. 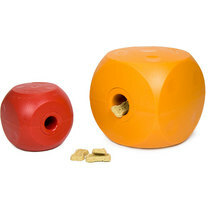 Both the top and bottom chambers feature adjustable openings to regulate the difficulty in which the dog removes the treats. It holds up to three cups of food in a variety of sizes, and is a great way to feed and exercise your dog. The Bob-A-Lot is made from a durable polymer with an anti-slip coating on the bottom. One size is appropriate for dogs of all sizes. Stimulate their mind. Make it easy or hard! The Buster Cube Food & Fun Puzzle is made in two sizes one for dogs under 10kg and one for dogs over 10kg. Fill with their daily food allowance and watch them work for their food. Great for keeping home alone dogs busy when you’re not there. As the dog gets more experienced and empties the cube faster, it is possible to increase the level of difficulty and thus maintain the value of the cube. This is done by turning the cylinder towards maximum or minimum respectively in order to adjust the speed at which the food is released during play. Do you know what your dog is doing right now? If he’s one of the many thousands of bored dogs in Brisbane he’s probably redesigning your living space. Congratulations, you’ve become a part of the latest craze in home renovations, bored dog décor. All dogs are motivated by food, if they weren’t they’d be dead! Upon inspection the supposedly ‘non food motivated’ dog is often quite curvaceous. Usually the ‘non food motivated’ dog has convinced his human that he needs to live on a diet consisting of delicacies such as roast chicken, fillet steak (preferably with gravy) and/or anything humans eat. Dutifully the human prepares something different when he turns his nose up at the latest offering. This is a finicky dog, a dog that has learned to manipulate humans into giving him the good stuff. This is quite different to being not motivated by food. Illness: Like humans, when dogs are ill they will often lose their appetite. Free Feeding (i.e. leaving food out for the dog to graze on): If you left me a constant supply of money why would I go to work? 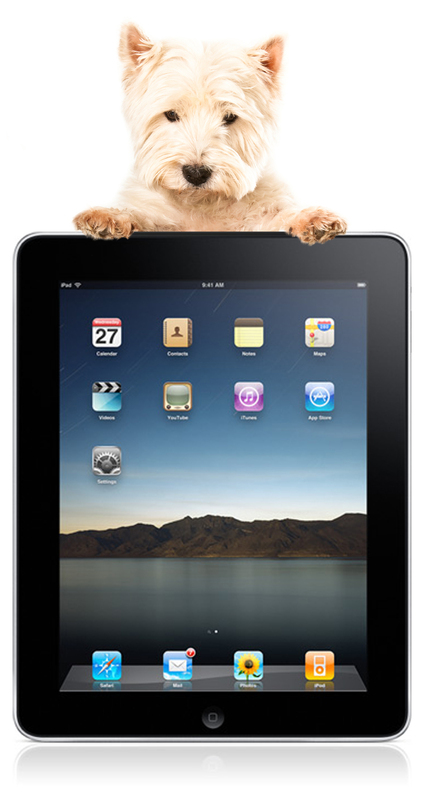 If your dog has access to food virtually anytime he wants why would he work for it? Stress: Often stressed dogs will refuse food. Some dogs become quite stressed around other dogs and groups classes may not be ideal for them. Try private lessons initially. Taste preferences: I hate seafood, some people think I’m crazy. Just because you think your dog should like what you have on offer, doesn’t mean he actually does. Satiation: If your dog is already full then of course he won’t be motivated to work for more. Who is motivated by food after Christmas dinner? Competing motivations: Some dogs appear to prefer ball or other dogs to food. This is only because they know you’re going to feed them that evening. Try putting them on a learn to earn program and watch their motivations change!